It was an ancient well dark and deep. It was surrounded by stones stacked in a circular fashion all about. I approached it to look into its depths and noticed the only way to peer into it was on my knees. A clever design I thought. It seemed to be on purpose. And I thought to myself there must be a purpose as if some builder of long ago meant for the well to only be approached in this way. As I peered into its depths I was saddened at what I did see No reflection of water below only old timbers and debris that had fallen into it. This well had been dry for quite sometime. My lips seemed drier than ever before. My tongue cleaved to the roof of my mouth. It was as if the sight of the dried well had made me realize a thirst that went deep into my soul. I looked about me and saw that which I had never seen before. A dry wind blew. Grass and trees were dry as if dead. Birds did not sing in the trees. They merely ruffled their feathers and tucked their beaks beneath their wings. Perhaps cold, perhaps they had abandoned all hope but somehow knew if there were such a thing as hope anymore it would happen here. I stood to my feet and pulled my cloak about me as the cold, gray wind seemed to chill me to the very core of my being. I looked at the well and felt its abandon. Then I felt drawn to the well once again. I circled it and saw something I had not noticed before. There knelt upon one side were bones, a skeleton, still kneeling, frozen in time. And clutched in his hand a strange hooked staff. I felt a chill run through me as I thought…some weary traveler such as myself, no doubt. Then as I began to consider the plight of this poor soul I thought to myself, how could this be? Surely anyone visiting this place would see the dryness of this well and leave this place to look for another place to quench the thirst that reached deep within. Or perhaps they would not abandon this well for they knew it was the only well that could quench that that thirsted within them. Then I knelt beside him and began to weep and cry out and as I did cry I began to feel the dryness of my own soul. reached as far down as I could within the well only to realize that the things which polluted this well were too deep for me to reach. Then I sat and realized no matter how determined I was that I could not remove the debris from the depths it had fallen. I turned to my silent friend and said, “It would take a fountain bubbling up from the depths to rise within this well. Only then would this debris arise and be washed away and flow once more”. The bones then made a cracking noise and I was sure I saw the skeleton’s head bob once as if to acknowledge what I said was true. But I must have only imagined it. At that moment, as I thought, I again felt the eyes upon me, then I walked about the well and knew all the more as I looked upon it that what I said was true for there was no device to draw from this well, and I could tell there never had been. I walked around it several times. I closed my eyes and envisioned what this place must have been before this well ran dry. I thought of weary travelers from miles around as they must have visited this place only to drink from the depths of its refreshing waters. I envisioned the animals waiting their turn when no one was watching coming to taste its life. I thought how green and lush it must have been all about. Then caught up in the vision I began to laugh and praise the creator of this place. I became intoxicated by the pictures I saw in my mind’s eye and did not realize my walk had turned into some sort of dance. Then I was jolted back to reality as I heard timbers moving and creaking against one another and I realized the sound came from deep within the well. I ran to kneel and look into its depths and heard another most wondrous sound. A sound of bubbling and rushing waters. I cried and I laughed at the same time. I even heard a bird in the tree as he awakened and heard him tweet almost in a questioning tone. It was true. The well was coming to life! I stood to my feet and rejoiced all the more and it seemed the more I rejoiced the more the sound of many waters began to rise. A wind began to arise and swirl all about me. The sound of waters rising began to grow and suddenly the waters burst forth like a geyser. Timbers and debris flew up into the air and fell I know not where. The wind and the water combined into an effervescent spray and it was as if I could drink the air around me. I breathed in its life and it felt as if every cell within me was coming to life all at once. Like fireworks going off in my soul! And as I looked around me it seemed all of nature was coming to life. I saw as if winter suddenly faded into spring as all became green all around me. Then a stranger approached with a staff and a hook in his hand and I saw sheep surrounding him like some shepherd of old. They all bent down to drink for the well had formed a river that flowed and along its banks were trees bearing all manner of fruit. Fields had bloomed in beautiful hues of every shade. Young deer pranced all about and the sun did shine its warmth. The shepherd then drew ever closer and I recognized the hooked staff in his hand. It was the same strange stick I had saw clutched by the skeleton by the well. 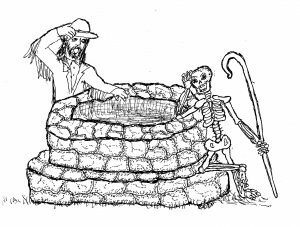 I shuddered a moment then smiled as I realized even the skeleton had came to life and the shepherd was he whom I knelt beside at the well. The shepherd then spoke that which I knew to be true. The well was my soul polluted and dry. Polluted with the cares of this world, water blocked that could not flow from the debris of a million lifetimes that should not have been. Abandoned and about to give up hope and walk away then I saw the bones of one who would never leave my soul to die. One who would die himself before he would abandon the well that could not go dry, the well that promised living water that would flow like rivers from my innermost being, waters that I could drink from and never ever thirst again. Then I looked in my hand and the shepherd’s staff was in mine and in a moment it turned into a scroll and on the scroll were the words of life. And the more I read, the more I rejoiced and I did thirst no more. 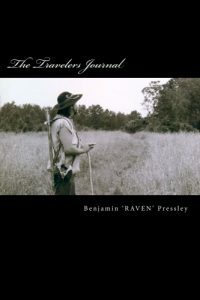 This is an original story from THE TRAVELER’S JOURNAL by Benjamin Raven Pressley. THE TRAVELER’S JOURNAL is full of inspirational stores and poems as well as great artwork by the author. To order your copy just click on the book image.